The royal gardens of the Loire Valley are as majestic as the region’s famous châteaux. On this tour, spend two days exploring the emblematic gardens of the châteaux of Cheverny, Chaumont-sur-Loire, Chenonceau and Villandry. Your botanical journey starts at the Château of Cheverny, where the English-style gardens are planted with century-old trees such as limes, cedars and sequoias. Enjoy a tranquil and environmentally friendly tour of the estate, exploring its forests and waterways by electric car or boat. Next, head to the vegetable garden created by the Marquise de Vibraye, where you’ll find a host of colourful flowers and vegetables whatever the season. Also not to be missed is the Jardin des Apprentis (Apprentices’ garden) between the château and the orangery – this ornamental pleasure garden covers an area once occupied by a formal French-style garden. After this visit, you’ll be more than ready for lunch! Several options are available to you. Just 15 minutes from Cheverny (7km) is the village of Chitenay, where you’ll find the Auberge du Centre. If the idea of a picnic appeals, then why not order a packed lunch from “Aux caprices de Cellettes” (20min – 11km), which you can enjoy on the banks of the Loire. 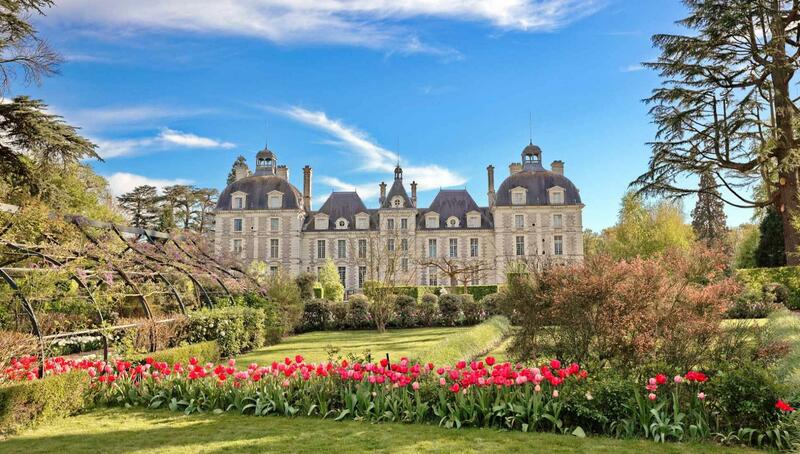 After lunch, head to Chaumont-sur-Loire, 40 minutes from Cheverny (26km), where the château, once the property of Catherine of Medici, is surrounded by fabulous gardens. 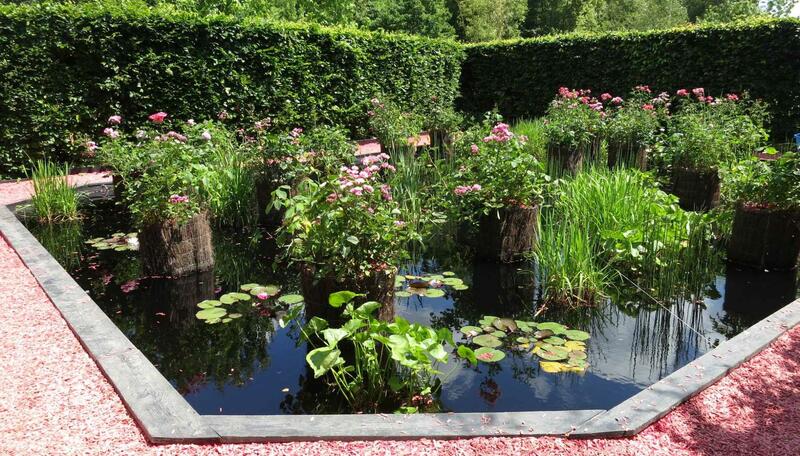 The best time to visit the gardens is during the International Garden Festival, held between April and October. During the festival, around thirty landscape gardeners from across the globe give free rein to their imaginations, creating a range of extraordinary gardens, all of which are inspired by a different theme each year. For dinner, you have a choice of two excellent restaurants in Amboise (30min/18km from Chaumont-sur-Loire): Chez Bruno or L’Epicerie. You also have two choices of accommodation, once again both in Amboise. The first is a hotel-restaurant right in the town centre: “Le Clos d’Amboise”, while the second option is a little more unusual: a wooden hut equipped with its own private jacuzzi at Le Manoir du Parc. 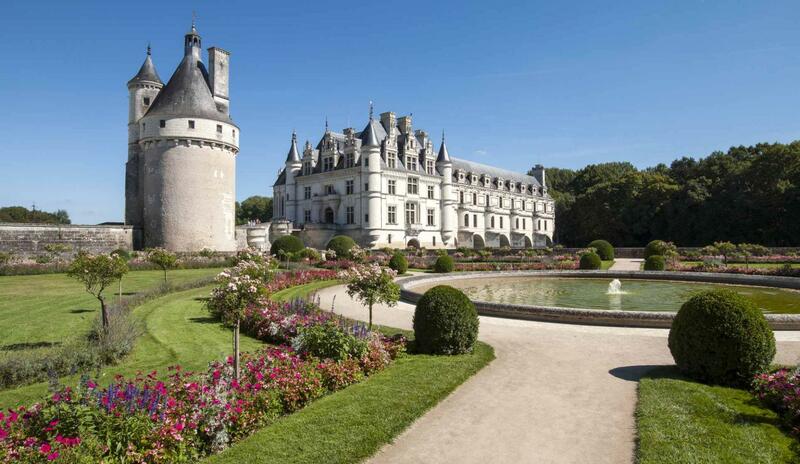 Leave Amboise and head to the Château of Chenonceau, just 25 minutes away (13km). This emblematic white château looks like a shimmering mirage in the waters of the Cher river. After visiting the château, take some time to explore the gardens which are strongly influenced by the French formal tradition. 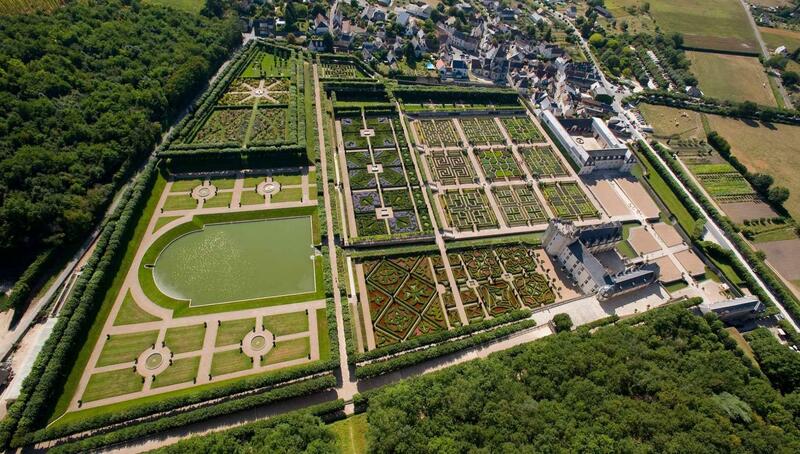 Don’t miss the sumptuous parterres in the Diane de Poitiers garden, covering an area of 12,000m2, the Catherine de’ Medici garden, the labyrinth, the Jardin Vert (green garden) and the Flower Garden. You have a choice of two restaurants for lunch. The first is “La Doulce Terrasse”, the restaurant at the Château of Villandry, 40 minutes from Chenonceau (50km). If you’re looking for a more gourmet experience, then why not try the Domaine de la Tortinière in Veigné, 35 minutes (36km) from Chenonceau? After lunch, make your way to the Château of Villandry, 40 minutes from Chenonceau (55km) or 25 minutes from Veigné (30km), where you’ll be amazed by its elegant French-style gardens. Laid out on three different levels, the terraced gardens comprise a vegetable garden, water garden and pleasure garden respectively; the latter is divided into different small gardens, including the “jardins d’amour” (gardens of love). The splendid vegetable garden consists of nine square plots planted with various flowers and vegetables, creating the illusion of a perfect multi-coloured draughtboard. There’s also a maze made from hornbeam hedges where you’ll enjoy getting lost for a while! And for a superb view of all of these delightful gardens together, make sure you take a stroll up to the belvedere. To return to Paris by car, allow 2hr 30min from Villandry (269km). If you’re travelling by TGV, head to Tours railway station, 25 minutes away by car (16km). The journey time back to Paris is 1hr 15min.